From helicopters to rockets, the aerospace industry needs their aircrafts to perform. To achieve reliable vehicles, all parts need to be crafted with excellence. From gears to rods and everywhere in between, safety depends on it. 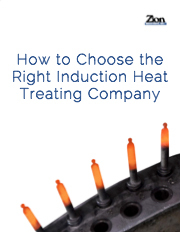 Zion Industries is proud to provide certified induction heat treating to the aerospace industry. We’ve been working with aeronautical entities since our inception in 1977. We understand the industry’s very specific needs. Our high-quality aerospace induction heat treating gives added strength to your parts, while our experienced team monitors your parts the entire way through the process. Zion typically works on parts that weigh 20 pounds or less, but contact us if you have a larger aeronautical part. Zion’s highly trained team specializes in high volume production runs. Our engineers have the ability to prototype and process development work. We strictly adhere to ISO/TS16949:2009 standards. Zion is one of the largest, most innovative, privately-owned heat treating companies in Ohio, Michigan and North Carolina. Why Choose Zion for Aerospace Heat Treating? All business is personal, even something like working at an induction heat treating company in the Rust Belt. Your company is your life’s work and you need to work with third parties who understand. From the construction industry to the aerospace industry, we enjoy the opportunity to help a host of people including our customers, suppliers and employees. For more than three decades we’ve been able to provide innovative process solutions and state-of-the-art technology and equipment to a variety of industries.